Pep Guardiola is said to have engaged in heated argument with Arsene Wenger for calling out Manchester City winger Raheem Sterling, a good diver. Wenger was furious over the incident as his remarks was heavily debated alongside the controversial penalty incident which gave City a momentarily 2-0 lead over the Gunners at the Etihad. 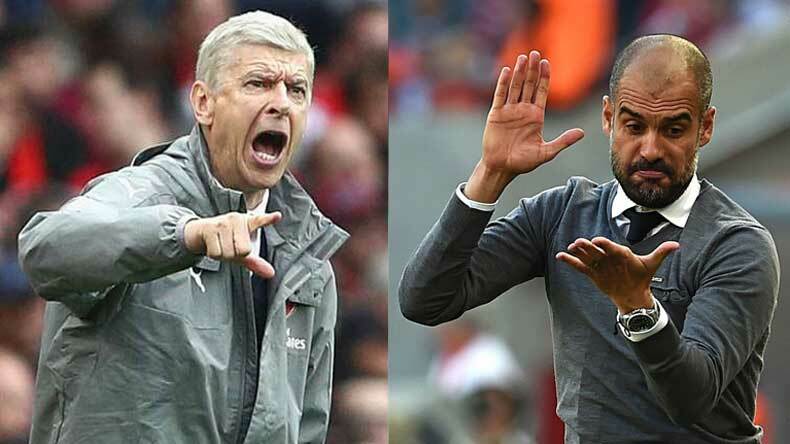 In the aftermath of Manchester City’s trounce over Arsenal last Sunday, Pep Guardiola is said to have engaged in a cold war of words with Arsene Wenger as the Citizens manager is furious over Wenger’s comments where he called Raheem Sterling, a player who dives well (falls to the ground quickly) in search of penalties. England and Manchester City winger Raheem Sterling was successful in winning a penalty on Sunday when his side collided with Wenger’s Arsenal. Sterling received a lofted pass over Arsenal’s defence where he was able to get the better of defender Kolasinac only to be brought down by Monreal in the 49th minute of the game. The penalty was successfully converted by target man Sergio Aguero and City added another in the 65th minute to scrap up the intriguing encounter at the Etihad 3-1. After the controversial incident, Wenger in his post-match conference called out Sterling and said, “We know that Sterling dives well, and he does that [win the penalty] very well.” Wenger was supported by several newspapers and match pundits but FA announced that they will take no action against the alleged dive by Sterling, who Arsenal tried to sign last summer. While the Pep Guardiola side in their defence said that Manchester City should’ve awarded another penalty when Sterling was brought down in the first half by Kolašinac. Sterling was trying to latch on Sane’s cross at that time. The club also defended their 22-year old winger by highlighting the fact how stood on his feet against Tottenham last season despite being pushed by Kyle Walker, who joined City next season. Former Premier League referee Dermot Gallagher while speaking to Sky Sports on Monday said that referee’s decisions in awarding the penalty to City over Sterling’s foul was the right decision. “Sterling is in possession of the ball, Monreal comes across and barges into him. The damage is done when he barges into him so it is an upper-body challenge,” Gallagher said. “Wenger would have been even more upset had he sent him off. You could argue that he is in on goal and hasn’t made a clear attempt to play the ball. It could have been a red card, but it is definitely a penalty,” he added.